After being injured on the job as a Michigan police officer a few years ago, Alex McKnight traveled as far north as he could without leaving the US. He ended up living in Paradise, Michigan where his father once owned a group of cabins that he rented out to tourists. Alex took over the business and now lives a quiet life along with just a few close friends. Paradise is one of those places where it's cold in the winter and just a tad warmer in summer. This July is almost as cold as early winter. The weather is horrible and that just matches Alex's disposition. His girlfriend Natalie is a police officer in Canada and they haven't been seeing much of each other lately. Natalie was recently transferred to another Canadian town and suddenly she is made an undercover cop. Alex is far from happy about it and hopes that Natalie remains safe. Meanwhile he spends the cold July days at The Glasgow, a bar owned by his friend Jackie Connery, drinking with Vinnie, a Native American, who is also Alex's his best friend. While visiting a new acquaintance, Alex and Vinnie hear a boat crash somewhere on the docks of the fog-laden Lake Superior. They investigate and discover a very expensive boat completely demolished. There are three men in the boat -- two are fine but the third is unconscious. The next day as Alex is drinking at the Glasgow, two of the rescued men come in and thank him for helping them. They also ask Alex if he found a box that was on the boat. When Alex says he didn't see anything, the men don't believe him and a fight breaks out. That night Alex finds out that the men have been to everyone who was involved in the rescue and asked about the box. It becomes clear that these men are very dangerous. Thus begins an excellent story line that involves gun trafficking and drug smuggling that take Alex and Vinnie all through Michigan and parts of Canada. 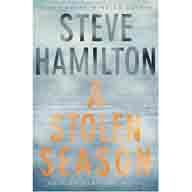 I found A STOLEN SEASON to be just as good, if not better, than the previous books in this series. Author Steve Hamilton has the rare talent in being able to write scenes that are unlike other action scenes ever written. Readers will find themselves engaged in the chases, wanting more. The characters are well rounded and as the series progresses Hamilton adds more details and history to them, so the readers really understand why they do the things they do. And I enjoyed the descriptions of Michigan, Lake Superior, and Canada. All three are an integral part of the story. The only time things got bogged down a bit was when Alex was with his girlfriend, Natalie. Even though Natalie is an interesting enough character and an important part of this tale, her relationship with Alex slows the story down. But to Hamilton's credit by the end of the book he has fixed that problem nicely. A STOLEN SEASON is an exceptional book. As with the prior novels in this series, it left me impatient to see how long it will take Steve Hamilton to write the next one.